(Xinmin via Daqi) How An Author Was Arrested In Beijing By The Weinan (Shaanxi) Police September 5, 2010. In mid-May 2006, Xie Chaoping was a reporter for <Square Circle> magazine. He was sent by his magazine to cover the subject of relocations in the Weinan area, Shaanxi province. The eventual report titled <655 denunciations> was never published because the Weinan city authorities were successful in stopping it through "public relations." Xie Chaoping wrote, "But this project led to an unexpected outcome -- I interviewed Zheng Yuan, director of the Weinan district migrant affairs office. Zheng Yuan and his 'firefighting team' gave me 10 kilograms of documentary material. After reading through this thick stack of materials, I finally understood the reasons for all the things that happened during the Weinan relocations." Beginning in late 2006, Xie Chaoping visited the Sanmen Gorge area six times to gather information. He also began writing. By the end of 2009, the investigative report <Migrants> was ready. Xie began to look for publishers. According to Xie Chaoping, he contacted a publishing company first. The response was "The work is very good, but our company is unable to publish it at this time." A friend of Xie at CCTV found another publisher, but their editor asked for the names of people and places be altered. Xie refused. In his third attempt, Xie sent his work to a publishing company in Guangzhou. They were willing to let Xie publish the book at this own expense. But by the time that they began to discuss the details, the publishing company came under pressure. Xie Chaoping claimed that his telephone was being monitored by the relevant Weinan authorities. According to Wei Pizhi, former director at <Spark> magazine, Xie sent the manuscript to him in early May this year. Wei suggested that the manuscript could be published as a supplement to <Spark>. Wei said: "But this supplement must not contain advertisements and it is not to be sold. You have to pay the printing fees yourself. But we won't charge you a cent." According to Wei Pizhi, the <Spark> editorial committee made a formal offer to publish the manuscript under the title <The Great Relocations> as a <Spark> supplement. Xie would pay for the printing himself. Xie was required to issue a written guarantee that there be no advertisements. Furthermore, the supplement will only be distributed for free or exchange at no cost. On May 20, Xie wrote a formal application: "The supplement shall contain no advertisements. It will not be sold on the market. It will only be given to certain migrants and the relevant departments to preserve as archival materials." According to Wei Pizhi, he was away on business and so he issued a verbal order to his secretary Wang Tianyong to send an agreement to Xie Chaoping. On the morning of May 24, Wei saw the letter from Wang to Xie and he became deeply perplexed by the fact that 10,000 copies were to be printed. He called Xie: "Don't you want this only to preserve history and to exchange information? Why do you need to print so many copies?" Wei Pizhi drafted an "emergency notice" immediately. "I asked Xie Chaoping to return the original letter which is null and void and I wanted him to act according to the emergency notice. Xie agreed at the time." Wei said that he asked someone to send the emergency notice to Xie and get the original letter back. Thereafter Wei did not pay any further attention to the matter. According to Xie Chaoping's wife Li Qiong, the emergency letter did not arrive until August 15. "Xie felt sorry for causing the publisher so much trouble, so he signed it." Xie wrote down these notes: "On the evening of the 15th, Xiao Wang came to my place to get my signature. The magazine wanted to print only 500 copies so that they can hand off the responsibility and avoid police harassment. This is risky. But there has been troubles for the magazine already. As I signed, I told Wang that the Weinan migrants have already duplicated 10,000 copies or so themselves." On June 26, Xie told his wife that several thousand copies of <The Great Relocation> have seen sent to Weinan city. After handing the books over to representatives of the migrants, he and his wife returned to Beijing. According to Weinan city Dali county migrant representatives Feng Lianbao, five or six public security workers and several County Cultural Department workers barged into his home early morning on June 27 and demanded that he hand over the copies of <The Great Relocation>. These people said that <The Great Relocation> was intended to inflame the migrants to cause trouble. The book also leaked state secrets. "Anyone who has this book will be firmly dealt with under the law." On July 28, Xie Chaoping received the news that <The Great Relocation> has been banned. The Weinan city General Administration of Press and Publications informed the Shaanxi provincial department that 8,300 copies of <The Great Relocation> have been confiscated. On the same day that the books were seized, <Spark> publisher Wang Zuozhong called Wei Pizhi: "An investigative report titled <The Great Relocation> published as a <Spark> supplement has been banned by Weinan city. Do you know about it?" Wei said: "We were responsible for it over here. There was nothing wrong with the manuscript. I and Secretary Chen Ronglin reviewed it. 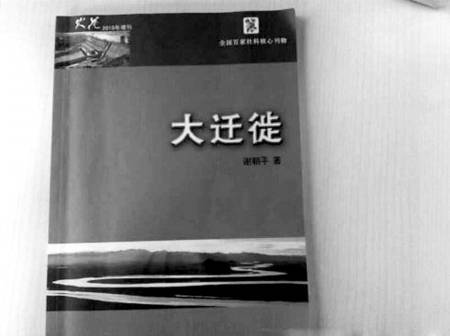 The author Xie Chaoping printed and distributed it at his own cost. The book was limited to free distribution. About 500 copies were printed. So how could it be banned by Weinan" Wang Zuozhong said, "We were not aware. We have told the provincial GAPP that it was not a <Spark> supplement. This is an extremely troublesome matter. You ought to deny it as well." On that same day, the Shaanxi provincial magazine <Spark> sent a letter to the Shaanxi provincial GAPP: "Our magazine had not published any supplement during 2010. The book <The Great Relocation> that is being investigated in Weinan has nothing to do with us." Wei Pizhi said: "This is definitely unacceptable. It is against the facts and it is unethical. This is not how I am. Most importantly, this work reflects the genuine feelings and sufferings of the masses!" Wang Zuozhong said: "Then we must immediately make another report to the Shaanxi provincial GAPP to explain." Wei Pizhi immediate wrote a letter of explanation to the Shaanxi GAPP and the Shaanxi provincial writers' association. Wang Zuozhong also sent a copy of the Weinan city GAPP report to the <Spark>'s Beijing office. The <Spark> Beijing office then wrote to the Shaanxi provincial and Weinan city GAPP's to protest the Weinan GAPP report. In that letter, the magazine took a strong stance by saying that <The Great Relocation> accurately reflected the sufferings of the masses. It asked the Weinan authorities: "Why are you so afraid of letting the people and the readers see the facts?" But the Weinan authorities never responded to this letter. On August 2, Weinan city public security bureau Linwei bureau vice-captain Zhu Fuli, police officer Wang Peng and another person went to Beijing. A police officer at the Beijing city Fengtai district Zhujiafen police station called Wei Pizhi and set up an appointment at 11:40am to discuss the <Spark> supplement <The Great Relocation>. Zhu Fuli and company arrived at the <Spark> office in the company of the Zhujiafen police. "I explained the process of how <The Great Relocation> was published in detail." Wei Pizhi said. "I really didn't understand the step about reviewing the supplement, so I broke the regulations. But this should not end up as police business." According to Wei Pizhi, Zhu Fuli said: "I never said that there was anything wrong with the contents. I only said that you violated the regulations." Wei Pizhi retorted: "Aren't you Linwei police extending your arms too long and getting too widely involved?" At that moment, the police officer Wang Peng suddenly stood up and shouted: "I am a police officer. I can get involved in anything that occurs on any inch of land in the People's Republic of China." The meeting ended on bad terms. On August 3, <Spark> magazine's Beijing editorial department informed the Central Publicity Department, the Ministry of Public Security, and the Shaanxi provincial and Weinan city leaders about the situation. They asked these leaders to restrain the Weinan police and not create another "Chou Zimin" incident. On the evening of August 19, Li Qiong called Wei Pizhi: "Xie Chaoping has just been taken away by the Linwei police ..."
At past 4pm on the day before yesterday, the Linwei public security bureau deputy director Wang Xiqiang revealed that the investigators are still gathering information in Langfang (Hebei province). Zhou Ze said that the Criminal Law Code states that only major criminals can be detained for 30 days before formal arrest. The police must apply to the Procuratorate for formal arrest within seven days for all other suspects. The Procuratorate also has seven days to consider the case. In total, a suspect needs to be formally arrested within fourteen days. "Xie Chaoping was detained on August 20. The police has not yet applied for his formal arrest. This indicates that they haven't got the evidence to arrest Xie. The case should never have started. It should be unconditionally rescinded now and Xie should be released." Li Qiong and Zhou Zhe are in Weinan now to demand the release of Xie Chaoping. The other purpose of their presence is to request the detention notice for Xie Zhaoping. According to the law, the police must inform a detainee's family or work unit about the reason and location of detention except in the unusual case of not having the contact information. It is also known that the Shaanxi provincial GAPP is sending people to supervise this case. Yesterday, the Chinese Writers Association's Committee To Protect Writers' Rights said that they are paying close attention to this case. Xie Chaoping is a member of the Sichuan Provincial Writers Association.